Talk about easy! All you need are two things: a tube of Pillsbury Crescent Rolls and a package of cocktails size hot dogs (or sausages). 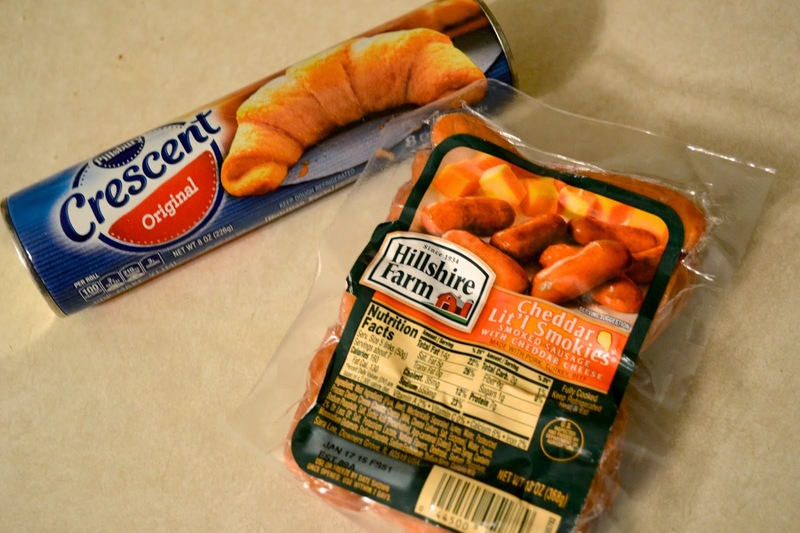 I usually use the plain ones but it can be fun to use the cheddar ones or any other flavored mini sausage. 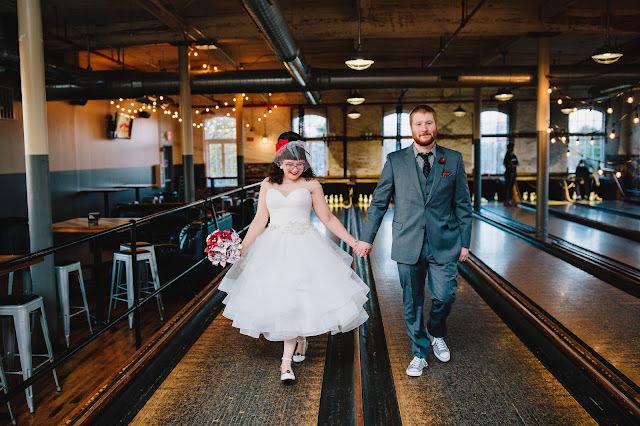 Use whatever tickles your fancy! There's not much of a recipe here. You essentially follow the cooking instructions on the Crescent Roll package when it comes to baking. Before all that, though, you need to roll out the dough and press down on the seams to make it all one sheet again. I use a rolling pin to flatten it out and even thin it out a little since I like to roll my weenies more than once for a fluffy pig in a blanket. I work with half the roll at a time. I will roll the first half of Cresent out first, use that half-sheet up, then pull out the second half. Typically, the rolls come with two sections. 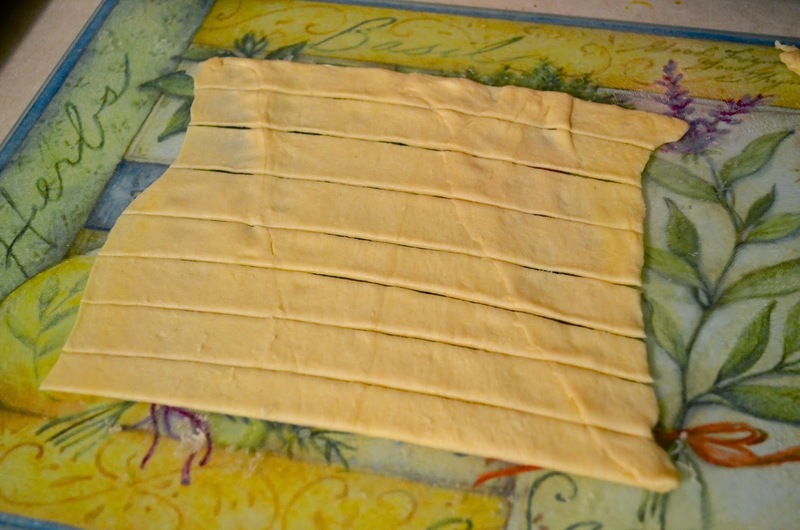 Using a pizza slicer, cut the Crescent Roll dow into narrow strips (essentially as wide as your weenies are). I like to dump the package of hot dogs out onto a couple pieces of paper towel to dry off any oils or liquids that come inside the package. 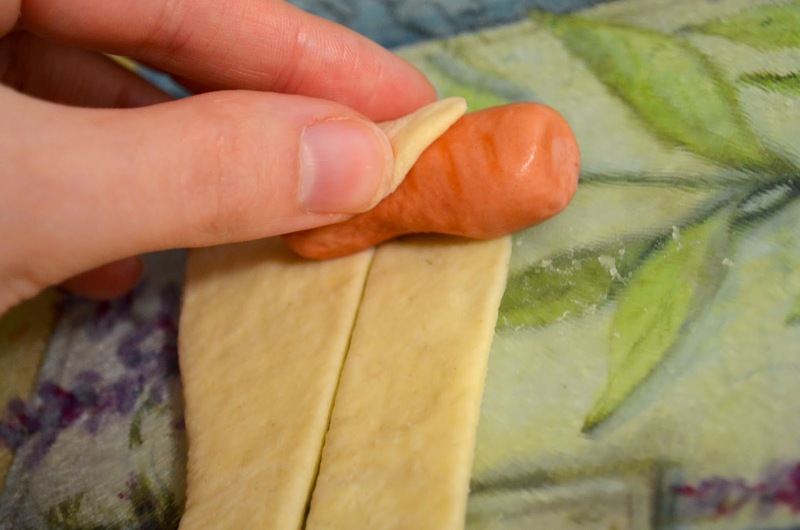 Then, once dried, I roll each hot dog into a strip of dough. I typically can cover two weenies per strip but it depends on how little or how much dough you want on your dog. It's up to you! 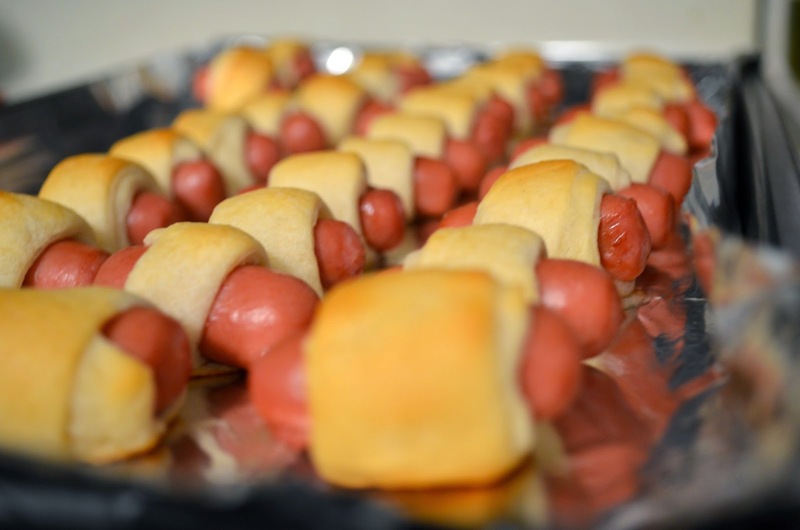 Line those puppies up on a tin foil covered cookie sheet (they can sit pretty close but the Crescent Roll dough will puff out a little so leave a little room between them) and pop them into the oven at 375 degrees for 10-12 minutes - or until the dough is golden brown and lovely. This is so super easy that I won't even include a recipe below. I trust you little minions to follow the above with ease. Whenever I bring these along to any party, they are the first snack to go. 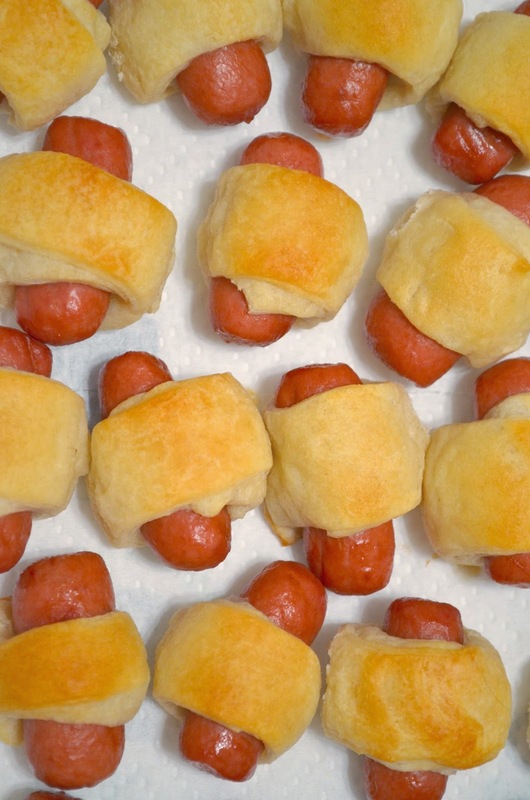 Who can resist pigs in a blanket? NO ONE, that's who! So I'm basically the worst pigs in a blanket eater ever. 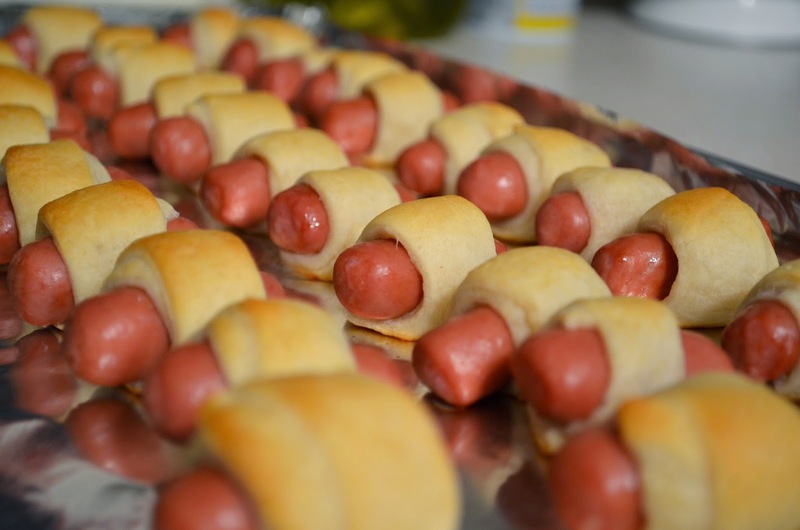 I don't eat pork (and have always just associated hot dogs as pork even though I know they make beef ones-it's weird I know), so I am that person who slips the little weenie out and just eats the blanket. It drives my family nuts because they are usually left to eat a bunch of sad, naked dogs, but it doesn't bother me one bit, haha!